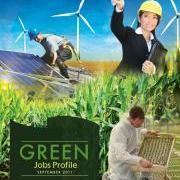 The Green Jobs Profiles highlight opportunities in the Green Economy including industry overviews for Biogas, Biomass, Geothermal, Green Building and Construction, Green Infrastructure, Solar Photovoltaic, Sustainable Forestry and Wind. The objective of the Green Business Survey was to engage businesses involved in renewable energy (RE), Energy Efficiency (EE), or Climate Change Adaptation (CCA) activities and to assess and identify potential job creation targets, skills needs, and workforce adjustment issues. The Green Economy provides both a challenge and an opportunity: an opportunity to accelerate job growth in industries that are rapidly growing, and a challenge to anticipate, strategize, and implement collective labour force measures to ensure a balance between workforce demand and supply. For more information on the strategic recommendations, please download the report Green Jobs Strategy Final Report and Recommendations. Social Enterprise refers to organizations with primarily social or environmental objectives where surpluses are reinvested into the business or used for community benefit. These ventures provide goods and services to the market for the purpose of creating a blended return on investment (both financial and social/environmental). Rather than maximizing shareholder value, the main aim of a social enterprise is to generate revenue to further their social or environmental goals. Social enterprise has been embraced by many not-for-profit and charitable organizations in the social services sector, but more and more it is seen as a viable option for for-profit businesses to make positive contributions to the environment. The greening of the Midwestern Ontario economy is already underway as policy initiatives and environmental pressures have created new opportunities for business and social enterprise in the region. From a strategic planning perspective it is important to examine what this transition will mean for employment and education institutions in terms of workforce and training needs, as well as employment trends and skills requirements. The Workforce System Framework for Green Jobs suggests a way for communities to work toward building a workforce within the green economy. The Framework identifies the foundational areas of the green economy: Policy Drivers, Transforming Industrial Sectors & Occupations, and Skill Changers. It also identifies operational issues, including roles and actions for community stakeholders such as Education & Training Institutions, Industry, Labour, Government and Employment services.